College of Science 1, University of Anbar, Baghdad, Iraq. Genetic Engineering and Biotechnology Institute 2, Baghdad University, Baghdad, Iraq. ABSTRACT: Mycobacterium tuberculosis (Mtb) is a pathogenic bacteria species in the genus Mycobacterium and the causative agent of most cases of tuberculosis. Tuberculosis (TB) is the leading cause of death in the world from a bacterial infectious disease. This antibiotic resistance strain lead to development of the new antibiotics or drug molecules which can kill or suppress the growth of Mycobacterium tuberculosis. The aim of this study is discovery a new drug molecules against the product of accD3 gene which play a vital role in mycolic acid biosynthesis pathway (MAP). 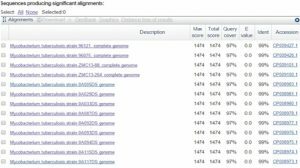 As a first step accD3 gene amplified from the complete genome of Mycobacterium tuberculosis Iraqi isolates and sequenced, eight out of twenty of the resulted sequences were chosen to achieve the in silico studies, these sequences have deposited in GenBank database with strain names (ALQM1, ALQM2, ALQM3, ALQM4, ALQM5, ALQM6, ALQM7, ALQM8 ) and Accession numbers (LC006979, LC008196, LC009412, LC009414, LC034168, LC038020, LC041163, LC041368) respectively, two drug molecules resulted from in silico studies and used in the practical application to prove the in vitro inhibitory ability of these molecules on viable cells of M. tuberculosis, REMA which is a colorimetric assay was used in this research to estimate the inhibitory application of these molecules. INTRODUCTION: Tuberculosis (TB) proved to be a controllable, preventable and curable disease, but it still remains as a leading cause for mortality1. It was declared a global health emergency in 1993 by the World Health Organization (WHO) when approximately 8 million Tb cases were estimated and 1.3-1.6 million deaths were occurred from the disease each year, now TB exacerbated by the spread of AIDS. Iraq has a high burden of TB and ranks 44th worldwide among countries with a high TB burden and 7th among the countries of the Eastern Mediterranean region. Anti - tuberculosis (TB) drug resistance is a major public health problem that threatens progress made in TB care and control worldwide. 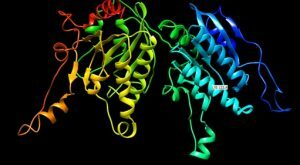 Rational Drug Design (RDD) is basically a computer-aided molecular modeling, it is an iterative process, If it is based on the knowledge of three - dimensional (3-D) structure of the target proteins of interest; it is called “structure based drug design” or “target based drug design”. 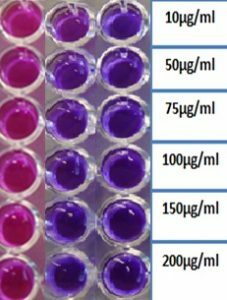 Eight nucleotide sequences were extracted from Iraqi Mtb isolates were used in this study, two molecules gave a good results in the inhibition of M. tuberculosis growth by using REMA test which is a colorimetric assay 2. The main aim of this study is the discovery of new drugs against Tuberculosis. MATERIALS AND METHODS: Sputum samples were collected from 200 Iraqi suspected patients who attended the Institute of Chest and Respiratory diseases / Baghdad, for the period from 1st of May 2013 to 31st July 2013. Their ages were ranging from 8 years up to 85 years, 50 of the total 86 positive cultures were randomly chosen to complete this study. DNA Extraction from M. tuberculosis isolates and primer design: DNA was extracted from pre diagnosed mycobacterial cultures and purified by CTAB method 3, 4. M. tuberculosis isolates were characterized at molecular level using LprM gene, primer pairs were used to amplify this gene to differentiate M. tuberculosis from the other types of mycobacteria 5, 6. The results showed that 43 isolates (86%) among of 50 isolate were M. tuberculosis. DNA sequences of accD3(1488 bp) was retrieved from puplic database, primers were designed for the gene at two position, segment I from (38-831) to give PCR product 793 bp. Segment II from (631-1482) to give PCR product 851 bp. There was an overlapped sequence about 300 bp. Which were curated manually. The resulted sequence covered the region from(39-1482), these were aligned using Clustal W, and phylogenetic tree was built using NJ method, all these sequences were deposited at NCBI/nucleotide (GenBank database) with Accession numbers (LC006979, LC008196, LC009412, LC009414, LC034168, LC038020, LC041163, LC041368). The primers sequences used in PCR experiments are shown in Table 1. Amplification of Target gene: AccD3 gene segments (SI and SII) were amplified separately. Each PCR mixture was prepared with 25 µl of Green Master Mix 2x(Promega), 17µl of nuclease free water, 2µl of each primer ( F,R) at 10µM, and 4µl of DNA (equaling 25 to 250 ng). Multiple PCR programs were used until reach to the optimum program which gives a good PCR product, the thermocycling conditions for SI and SII were 94 °C for 5 minutes, followed by 35 cycles of denaturation at 94 °C for 1 minute , and annealing at 59 °C for 1.30 minute and 72 °C for 1 minute, then the final extension steps at 72 °C for 10 minutes. PCR amplified products (10µl) and DNA molecular –weight marker (Ladder) were electrophorized on 1% Agarose gel with ethidium bromide staining to verify the size of the amplicon, the resulted PCR product were sequenced (NICEM-USA, Apparatus: Applied Biosystem). 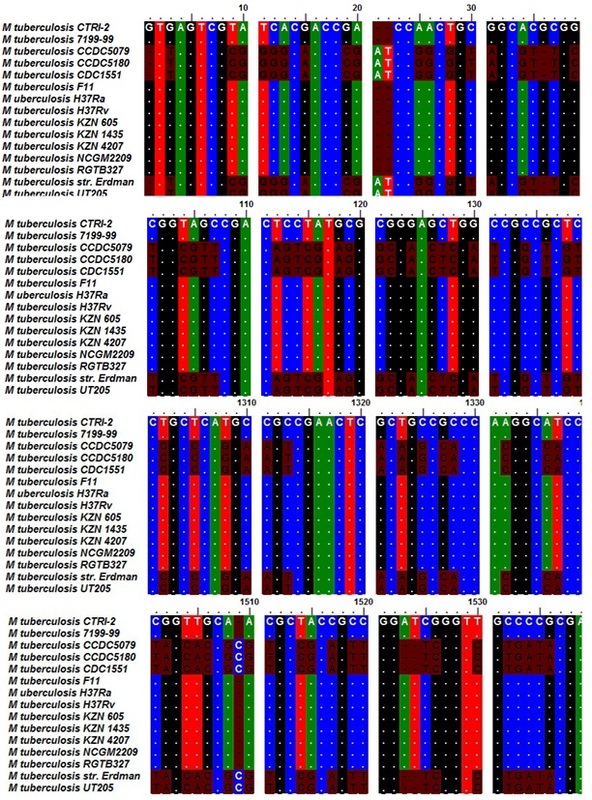 RESULTS AND DISCUSSION: M. Tuberculosis contain multiple versions of accD genes that encode α and β subunits of at least three distinct multifunctional acyl CoA Carboxylase Complexes 23, 24. The function of a number of genes involved in fatty acid and mycolic acid biosynthesis are known for their role in the survival of pathogenic M. tuberculosis 25, 26. In this study, (Rv1970) gene was used to differentiate M. tuberculosis from the other of M. tuberculosis subspecies, LprM (Rv1970) is a gene lies in the RD7 region 27, 28. In prior studies, PCR analysis revealed RD7 to be present in all of the tested M. tuberculosis but not in the evaluated M. microti, M. bovis, M. bovis BCG, and M. caprae strains 29, 30. Primers were used to amplify Rv1970 (mce3E) and the PCR results were positive for 40(80%) of isolates (Figure not shown). 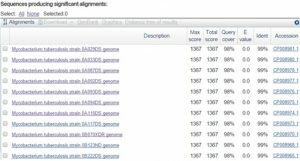 Two PCR products of typical M. tuberculosis phenotype namely Asraa 1 and Asraa 2 were sequenced and deposited in NCBI with Accession numbers KJ809110, KJ809111 respectively and at DDBJ database with Accession numbers LC009880, LC009881. In this study, accD3 (Rv0904c) was used as a target protein for Computer Aided Drug Design because the product of this gene is acetyl-CoA carboxylase which catalyzes the first step in the pathway of fatty acid biosynthesis in M. tuberculosis. Acetyl - CoA is coupled with (Carbon mono Oxide ) CO to form malonyl - CoA, which is used solely for the production of fatty acids and related compounds, this step is the main point for regulation of the entire pathway, thus making it an attractive target for the development of new drugs 31, 32. H37Rv strain was used as the reference strain in this study, accD3 (Rv0904) sequence of H37Rv was retrieved from NCBI and aligned with other M. tuberculosis strains to find the conserved regions in the accD3 sequence among the different strains. Fig. 1 shows the alignment results using Clustal W incorporated in Bio Edit program. The information about the target gene (accD3) were collected from VFDB (Virulence Factor of Pathogenic Bacteria) and Tuberculosis databases, Rv0904c (accD3) is a gene located at 1006693 – 1008180 from M. tuberculosis (H37Rv) genome and considered a relatively long gene (Fig. 2). Due to the long length of the gene, it was divided in to two segments (SI and SII). Primer pairs for SI able to amplify the region on genome at location (38-831) with PCR product 793 bp which represent the first half of target gene and primers pair for SII able to amplify the region (631-1482) with PCR product 851 bp which represent the second half of the target gene as shown in Table 2. 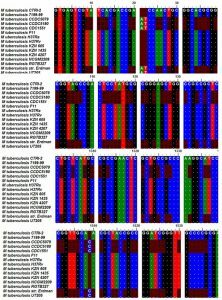 The forty positive for M. tuberculosis isolates were subjected to PCR amplification and the designed primer pairs for the two segments of accD3 gene were used to amplify the region of accD3 gene at location 1006693-1008180 on the M. tuberculosis genome. (Figures not shown). The resulted products were sequenced. BLASTn at NCBI showed that these sequences were matched with M. tuberculosis at Query cover 98% for SI and 97% for SII and identity percentage reached to 99% at E-value 0.00 as shown in Fig. 3 for SI and Fig. 4 for SII. The whole sequences of accD3 of different strains of this study (ALQM1, ALQM2, ALQM3, ALQM4, ALQM5, ALQM6, ALQM7, ALQM8) were deposited at NCBI with Accession numbers (LC006979, LC008196, LC009412, LC009414, LC034168, LC038020, LC041163, LC041368) respectively. The eight nucleotide sequences were translated in to amino acids (495 amino acids) sequences using EMBOSS software (http://www.ebi.ac.uk/Tools/ emboss/) and the resulted protein sequences were subjected for confirmation, then the eight protein sequences modeled by using SWISS-MODEL server (http://swissmodel.expasy.org/) 13 with three templates 2f9y, 2f9i and 1xou proteins, Fig. 5 shows the best model for accD3 model. 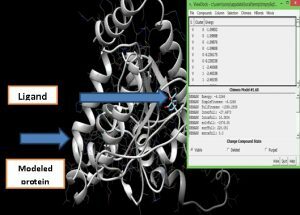 Docking: Many softwares are available to predict the molecular interactions that may occur between a target protein and small molecule. Among these Swiss Dock, which is a web server dedicated for docking of small molecules on target proteins 37. All 22 molecules and models of this study were entered to EADockDSS engine in the Swiss Dock server and the results were visualized with UCSF Chimera. Five molecules have a high negative free binding energy (lowest binding energy) and these were chosen for pharmacophore building 38. The characterization of the structure and the energetics of molecular complexes are a key factor for understanding biological functions and the energetics often provides the most important and useful link between structure and function of biomolecular systems. Furthermore, the prediction and design of ligands that can reversibly bind to pharmaceutical targets (enzyme inhibitors, receptor agonists and antagonists etc.) is at the heart of structure-based drug design. To be able to predict the strength of noncovalent associations, as well as the structures of molecular complexes, has therefore been an important objective in computational chemistry 39. Virtual screening (VS) is the process of evaluating a library of compounds using a computational model in order to rank, and thus screen for molecules that exhibit desired characteristics, LBVS (Ligand based virtual screening) was adopted in this study and pharmacophore model generated from a set of known ligands which was used in the virtual screening to elicit specific inhibitors against accD3 protein 40, 41. In this study, Discovery Studio program 42 was used for pharmacophore modeling and the five molecules from the previous step were entered to the Hip Hop generator at Discovery Studio program and gave two hypothetical pharmacophores (pictures not shown). These pharmacophores were used in the Zinc Pharmer program (pictures not shown). Zinc Pharmer provides tools for constructing and refining pharmacophore hypotheses directly from molecular structure 43. One thousand molecules were obtained from Zinc database after filtering through Lipinskie’s rules of five, All molecules tested for their mutagenicity and toxicity with LAZAR and T.E.S.T softwares. For accD3 modeled protein ( H37Rv strain), All molecules gave a negative binding energy (positive docking results) ranged between -2.3 as a lowest value and -36.7 as a highest value. Twenty nine molecules gave a negative binding energy with accD3 modeled protein (ALQM1 strain) ranged between -1.15 as a lowest value and - 43.6 as a highest value. The same molecules gave a negative binding energy with the model of ALQM2 strain with -2.3 as a lowest value and -46.3 as a highest value. Twenty seven out of 30 gave a negative binding energy with the modeled protein of ALQM3 strain and values ranged between -1.4 as a lowest value and -43.5 as a highest value. Twenty nine out of 30 gave a negative binding energy with the modeled protein of ALQM4 ranged between -0.1 as a lowest value and -43.5 as a highest value. All 30 molecules gave a negative binding energy with the model of ALQM5 strain and the value ranged between -3.34 as a lowest value and -42.08 as a highest value. Twenty seven out of 30 molecules gave a negative binding energy with the modeled protein of ALQM6 and the values ranged between -1.45 as a lowest value and -43.9 as a highest value. The same molecules gave a negative binding energy with the modeled protein of ALQM7 strain and the values ranged between -0.6 as a lowest value and -43.7 as a highest value. All molecules gave a negative binding energy with the modeled protein of ALQM8 and the values ranged between -1.9 as a lowest value and -38.8 as a highest value. Two molecules with Zinc ID (391093, 16051516) are commercial available, the chemical structures of these molecules are shown in Fig. (7 A, B). 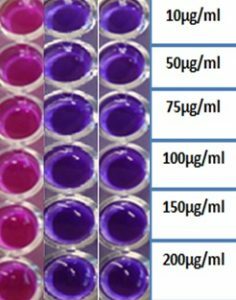 In vitro Application of Drugs: In this study, Resazurin Microtiter Assay Plate (REMA) was used to prove the inhibitory activity of ligands against the viable cells of different strains of M. tuberculosis, this test based on Resazurin which is a blue - purple, non-toxic, oxidation-reduction indicator that becomes pink when reduced to resorufin by cellular oxidoreductases 44. 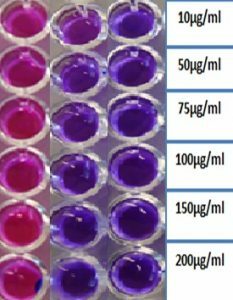 This assay is colorimetric and the rate of color change is directly proportional to the number of viable cells in the initial suspension. 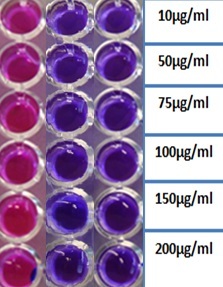 In other words, the concentration of viable cells in a suspension containing resazurin directly determines the visible conversion from purple to a pink color 44, 45. The wells with dark purple color are more sensitive to the added molecule suspension when compared with wells of the control, and this match with the study of 45, in this study, six different concentrations (10 µg/ml, 50 µg/ml, 75 µg/ml, 100 µg/ml, 150µg/ml, 200µg/ml) of Ligand I (trans-Cinnamic acid), Ligand II (2'-Hydroxypropiophenone) and Ligand III (as a control) (4-Amino-2-hydroxybenzoic acid) were applied on sensitive and MDR strains of M. tuberculosis and the inhibitory activity of these ligands determined depending on color change from blue - purple (resazurin color ) to pink color as shown in Fig. 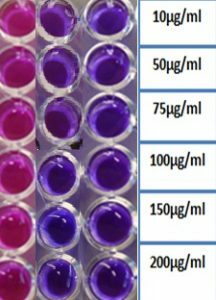 8 for ligand 1 which have been inspect visually the effect on two sensitive strains of M. tuberculosis (sensitive to the routine drugs regime in TB treatment), the results described as high sensitive to the new ligands at concentration above 10µg/ml. Fig. 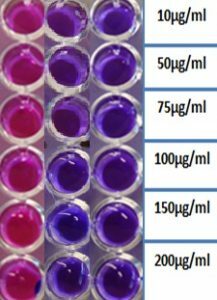 9 shows the effect of ligand I on two MDR strains of M. tuberculosis, the results described as high sensitive to the new ligands at concentration above 75µg/ml. Fig. 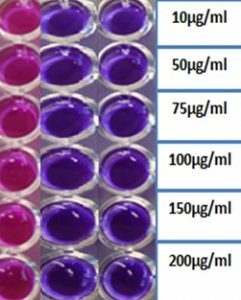 10 shows the effect of ligand II on two sensitive strains of M. tuberculosis and the results described as high sensitive at all concentrations. Fig. 11 shows the effect of ligand II on two MDR strains of M. tuberculosis and the results described as high sensitive at concentration above 75µg/ml. Fig. 12 shows the effect of ligand III on two different sensitive strains of M. tuberculosis and the results described as high sensitive at all concentrations. Sensitive isolate: Trans-Cinnamic acid is effective at 100µg/ml, 150µg/ml & 200µg/ml. It is obtained from oil of cinnamon, it is also found in shea butter. 46 used trans - cinnamic acid as anti-hepatitis virus agent. 2'-Hydroxypropiophenone is effective at all concentrations. It is used as a flavorant to enhance the flavor of wintergreen-flavored products 47. 4-Amino-2-hydroxybenzoic acid is effective at all concentrations. Trans-Cinnamic acid is very effective at 150µg/ml, 200µg/ml. 2'-Hydroxypropiophenone is very effective at all concentration. The difference of effects attributes to the variations of sensitive strains, and due to the changes occurred in mutated strains, looking for the real reasons need more studies at least at the molecular level. It might be expected to be something related to permeability and pump effluxes. ACKNOWLEDGMENT: A special thanks for the NRL (National Reference Laboratory) at the Institute of Chest and Respiratory diseases / Baghdad for their cooperation in the achievement of this research. Global tuberculosis control Geneva, WHO Report, 2012. Amir, A. Rana,K. Arya, A. Kapoor, N. Kumar, H. and Siddiqui, M.: Mycobacterium tuberculosis H37Rv: In Silico Drug Targets Identification by Metabolic Pathways Analysis. International Journal of Evolutionary Biology: 2014; 1-8. Soolingen , B. Huard, J. Lazzarini, L. and Ray , W. PCR-Based Method To Differentiate the Subspecies of the Mycobacterium tuberculosis Complex on the Basis of Genomic Deletions. Journal of Clinical Microbiology, 2013; 41:1637-1640. Van Helden, D. Thomas, C. Robin, M. and Eileen, G. Isolation of DNA from Mycobacterium tuberculosis. Methods in Molecular Medicine, 2001 Mycobacterium Tuberculosis Protocols vol. 54. John Wiley & Sons, Canada. Ahmed S , El-Shazely S , Mustafa A , AL-Attiya R .The Six mammalian cell entry proteins (Mce3A-F) encoded by mce3 operon are expressed during in vitro growth of Mycobacterium tuberculosis . Scand J Immunol, 2005; 62: 16-24. Abdul-Jalil, A. Al-Khafaji, Z. Mankhi, A. Ali, R. and Al-Ani, M. Study of LprM gene in Iraqi mycobacterium tuberculosis World Journal of Pharmacy and Pharmaceutical Sciences, 2014; 3: 142-151. Matthiesen, R.: Bioinformatics Methods in Clinical Research. Humana Press, New York, USA 2010. Apweiler, R. Bairoch, A. Barker, W. Boeckman, B. and Ferro, S. Uniprot: The universal protein knowledgebase. Nucleic Acids Research, 2004; 32: 115-119. Kanehisa M, Goto S, Sato Y, Kawashima M, Furumichi M and Tanabe M: Data, information, Knowledge and principle: back to metabolism in KEGG. Nucleic Acids Research, 2014; 42: 199-205. Krogh, A. Larsson, B. Von, G. and Sonnhammer, E. Predicting transmembrane protein topology with a hidden Markov model: application to complete genomes. Journal of Molecular Biology, 2001; 19: 567-80. Lew J, Kapopoulou A, Jones L and Cole S: Tuberculist – 10 years after. Tuberculosis (Edinb), 2010; 91:1-7. Koichiro, T. Glen, S. Daniel, P. and Sudhir K. MEGA6: Molecular Evolutionary Genetics Analysis Version 6.0. Molecular Biology and Evolution, 2013; 30: 2725–2729. Kiefer F, Arnold K, Künzli M, Bordoli L, Schwede T: The Swiss-Model Repository and associated resources. Nucleic Acids Research, 2009; 37: 387–392. Marco, B. Stefan, B. Andrew, W. Konstantin, A. and Gabriel S. Swiss-Model: modelling protein tertiary and quaternary structure using evolutionary information. Nucleic Acids Research, 2014; 42: 252–258. Benkert, P. Künzli, M. and Schwede, T. Q MEAN server for protein model quality estimation. Nucleic acid Research, 2009; 37: 510 – 514. John, J. and Brian, K. Zinc – A Free Database of Commercially Available Compounds for Virtual Screening. Journal of Chemical Information and Modeling, 2005; 45: 177–182. Koes, D. and Camacho, C. Zincpharmer: Pharmacophore search of the ZINC database. Nucleic Acids Research, 2012; 40: 409-414. Tsai, K. Teng, L. Shao, Y. Chen, Y. Lee, Y. and Li, M. The first pharmacophore model for potent NF-kappa B inhibitors. Bioorganic and medicinal chemistry Letters, 2009; 19: 5665-5669. Helma, C. Lazy structure-activity relationships (lazar) for the prediction of rodent carcinogenicity and Salmonella mutagenicity. Molecular Diversity, 2006; 10:147-58. Sushko, I. Novotarskyi, S. Körner, R. Pandey, A. Cherkasov, A. and Li, J. Applicability domains for classification problems: benchmarking of distance to models for AMES mutagenicity set. Journal of Chemical Information and Modeling, 2010; 50: 2094-2111. Della L: Mycobacteriology and mycobacterial susceptibility tests. In: Clinical Microbiology Procedures Handbook. Second edition. Henry D. Isenberg Editor in Chief, ASM Press 2004. 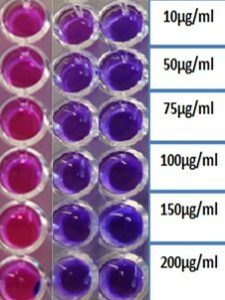 Martin, A. Palomino, J. Colorimetric Redox Indicator (CRI) Drug susceptibility testing for Mycobacterium tuberculosis, 2012; 6. Holtona, S. J. King-Scotta, S. Nasser Eddine, A., Kaufmann, S. Wilmanns, M. Structural diversity in the six-fold redundant set of acyl-CoA carboxyl transferases in Mycobacterium tuberculosis. FEBS Letters, 2006; 580: 6898–6902. Noll, H. and Bloch, H. Studies on the chemistry of the cord factor of Mycobacterium tuberculosis. Journal of Biology and Chemistry, 1955; 224:149–163. Gago, G. Kurth, D. Diacovich, L. Tsai, S. and Gramajo. H. Biochemical and Structural Characterization of an Essential Acyl Coenzyme A Carboxylase from Mycobacterium tuberculosis. Journal of Bacteriology, 2006; 188: 477–486. Gande, R. Gibson, K. Brown, A. Krumbach, K. Dover, L. Sahm, H. Shioyama, S. Oikawa, T. Besra, G. and Eggeling, L. Acyl-CoA carboxylases (accD2 and accD3) together with a unique polyketide synthase (Cg-pks) are key to mycolic acid biosynthesis in Corynebacterianeae like Corynebacterium glutamicum and Mycobacterium tuberculosis. Journal of Biology and Chemistry, 2004; 151:1-47. Behr, M. Wilson, M. Gil, W. Salamon, G. Schoolnik, S. and Small, M. Comparative genomics of BCG vaccines by whole-genome DNA microarray. Molecular Microbiology, 1999; 284:1520-1523. Gordon, S. Brosch, R. Billault, A. Garnier, T. Eiglmeier, K. and Cole, S. Identification of variable regions in the genomes of tubercle bacilli using bacterial artificial chromosome arrays. Molecular Microbiology, 1999; 32:643–655. Mitarai, S. Kurashima, A. Tamura, H. Nagai, and H. Shishido. Clinical evaluation of Amplicor Mycobacterium detection system for the diagnosis of pulmonary mycobacterial infection using sputu Tuberculosis, 2001; 81: 319–325. Mostowy, S. Cousins, J. Brinkman, A. Aranaz, and Behr. M. Genomic deletions suggest a phylogeny for the Mycobacterium tuberculosis Journal of Infectious Disease, 2002; 186:74–80. Heath, R. Rock, C. Fatty acid biosynthesis as a target for novel antibacterials. Current Opinion in Investigational Drugs, 2004; 5:146-153. Anandhakrishnan, M. Structural and Functional Studies on Acyl-CoA Carboxylases of Mycobacterium tuberculosis. Ph.D thesis2013; University of Heidelberg, Germany. Wang, J. and Shen, H. Direct observation and completion of treatment of tuberculosis in rural areas of China. Scandinavian Journal of Public Health, 2009; 37: 304-309. Menzies, D. and Elwood, K. Treatment of tuberculosis disease. Canadian tuberculosis standards – 7th edition 2013. Kolyva, A. and Karakousis, P. Old and New TB Drugs: Mechanisms of Action and Resistance .Understanding Tuberculosis-New Approaches to Fighting against Drug Resistance, 2012; 209-229. Hartkoorn, R. Sala1, S. Joa˜o Neres, Magnet1, Raju Mukherjee, F. Uplekar, S. Altmann, K. and Cole, S. Towards a new tuberculosis drug: pyridomycin – nature’s isoniazid. Molecular medicine, 2012; 4: 1032-1042. Grosdidier, A. Zoete, V. Michielin, O. SwissDock, a protein-small molecule docking web service based on EADock DSS. Nucleic Acid Research, 2011; 39: 270-7. Skariyachan, S. Ashwini, M. Hina, A. Jain, D and Abhilash, M. Design and discovery of novel therapeutic drugs against Helicobacter pylori gastroduodenal cancer by in silico Research Journal of Pharmaceutical Biological and Chemical Sciences, 2011; 1: 1005-16. Brandsdal, B. Österberg, F. Almlöf, M. Feierberg, V. Luzhkov, V. and Johan Å. 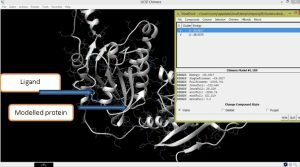 Free Energy Calculations and Ligand Binding. Advances in Protein Chemistry, 2003; 66: 123-158. Lee, C. Huang, H. and Juan, H. Reviewing ligand-based rational drug design: the search for an ATP synthase inhibitor. International Journal of Molecular Science, 2011; 12: 5304-5318. Brown, J. and Okuno, Y. Unifying Bioinformatics and Chemoinformatics for Drug Design. Systems and Computational Biology – Bioinformatics and Computational Modeling, 2011; 100-120. Desaphy, J. Azdimousa, K. Kellenberger, E. and Rognan, D. Comparison and druggability prediction of protein-ligand binding sites from pharmacophore-annotated cavity shapes. Journal of Chemical Information and Modeling, 2012; 52: 2287–2299. 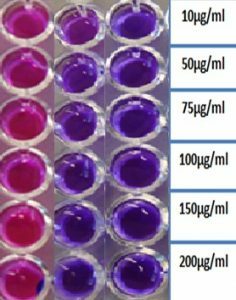 Vega-Avila, E. and Pugsley, M. An overview of colorimetric assay methods used to assess survival or proliferation of mammalian cells. Proceedings of the Western Pharmacology Society, 2011; 54:10–14. Hudman, D. and Sargentini, N. Resazurin-based assay for screening bacteria for radiation sensitivity. Springer Plus, 2013; 2:1-6. Wang, L. Geng, C. Ma, Y. Luo, J. Huang, X. Chen, H. Zhou, N. Zhang, X. Chen, J. Design, synthesis, and molecular hybrids of caudatin and cinnamic acids as novel anti-hepatitis B virus agents. European Journal of Medicinal Chemistry, 2012; 54:352-65. Ashurst, P., Food Flavorings, AVI/Van Nostrand Reinhold, 1991; 209. Abdul-Jalil AA and Al-Khafaji ZM: New inhibitors against accD3 gene of Mycobacterium tuberculosis, in-silico study and in -vitro application. Int J Pharm Sci Res 2017; 8(7): 2839-48.doi: 10.13040/IJPSR.0975-8232.8(7).2839-48.